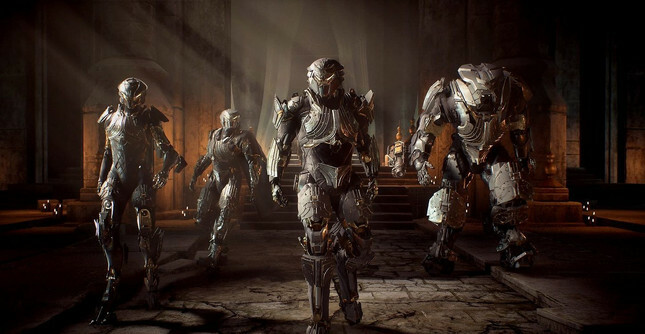 BioWare has confirmed that a social space for Anthem is in the works. Taking to Twitter, lead producer Michael Gamble offered a peek at the upcoming Launch Bay feature. The Launch Bay will support up to 16 players at a time, and will let players access new contracts, adjust their Javelin's build, and most importantly... show it off to their friends. The space will be a separate area from both the personal hub of Fort Tarsis, and the open-world where players tackle missions. Its addition was a direct response to the community, which has been asking for a feature similar to Destiny's Tower. The Launch Bay space won't be available in-game at launch, with Gamble noting "we figured that we could show you BEFORE launch how we plan [sic] continue to be AFTER launch."